An overview of the crannog site at Drumclay revealing the wattle wall remains of both round houses and later period rectangular houses that bears evidence to viking influences dating back over a 1000 years. Archaeologists working on the site of the Drumclay Crannog believe they could have uncovered the largest medieval building in Ireland. Over 4,000 finds have been made on the artificial island which, according to one of the excavators on site, will help archaeologists to "look with new eyes at our medieval past". Nora Bermingham is one of 26 archaeologist working on the Crannog. Describing the excavation as the most significant here in over 80 years, she says the work being conducted on behalf of the NIEA will leave a long-lasting legacy. "We have upwards of 30 houses on the site and there are several parts of houses appearing but one of the buildings is considerably large," she told The Impartial Reporter, "It has the potential to be up to 12 metres in diameter. It is not fully exposed at the moment. It has a very large central fireplace around which a series of logs were placed to form floorboards. It may well be one of the largest, if not the largest buildings from that period on the Island. "So it is hugely significant in itself." Among the latest finds at the Crannog are a number of mineralised animal faeces known as 'copper lights'. 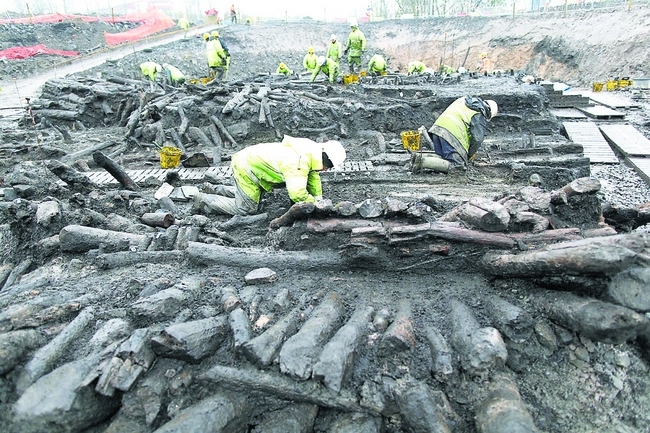 "They are usually found on sites such as this but they help to paint the overall picture," she explained, "We know they had animals on the Crannog, it confirms some of the theories that we had about what the Crannog was used for. These people were farmers, they had a connection with animals." The Crannog was subject to a recent break-in, which, according to Nora, is not unusual on archaeological sites of this nature. "Sites like this are often subject to petty vandalism," she said, "Unfortunately it is one of those things that happens and this scheme is no different. It was just petty vandalism though, so no real damage was caused." Earlier this week Environment Minister Alex Attwood officially announced that a second public Open Day is to take place next Saturday (February 16) in response to the massive public interest expressed during the previous event. "Discoveries made during the first ever substantial excavation of a crannog in Northern Ireland continue to reshape national and international thinking on crannogs and the lives of people stretching back 1,300 years at least," he said. "Each layer has revealed even more about the past. I want to give the public another opportunity to visit the site." According to Nora, the public Open Days have provided a rare opportunity for archaeologists to interact with members of the public. "We have all been delighted with the level of public interest shown in the work going on here. "This waterlogged anaerobic site has given us what you don't tend to get anywhere else in terms of volume and the preservation of the finds. "At most excavations you would be lucky to get 20 to 30 items. But people lived here for centuries -- they kept coming back to live on this crannog, so for some reason it was hugely important locally. "I think it's always a good idea to engage with the local public too, and if that means keeping items here in the local museum, then why not? "This site is incredibly significant. "It stands apart from any other because we have had the opportunity to excavate using modern techniques. People should know we are producing really great results and that we have a wealth of material."